Thank you sirI. 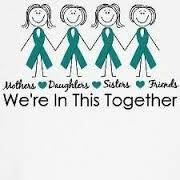 I really appreciated your thread about ovarian cancer! That was very kind of you. The "forgotten twins" in the words of one of my gyn onc colleagues. Exactly. On "Good Morning America" today there was a fairly long segment on break cancer. (Some celebrity I've never heard of is recovering from it.) A few days earlier, they were outside, and there was a group of women holding up a banner about ovarian cancer. George Stephanopolous mentioned that it was Ovarian Cancer Awareness month. I think he spoke for about 5 seconds before Robin Roberts interrupted him and changed the subject. Shameful. Just found your blog my dear! Thank you for this! You're quite welcome. I'm glad you found the blog...please feel free to comment if you wish.